This article will focus on the topic about the solution for increasing the size of C drive when has low disk space on Windows Server 2008. Download IM-Magic Partition Resizer Server to fix low disk space problem on Windows Server 2008 C drive. It is easy and safe. It is a common problem that C drive runs on low disk space on Windows Server 2008, but the good news is that you can increase size of C drive without repartitioning hard disk. You only need to rely on third-party partition software to resize the hard disk and make C drive larger. IM-Magic Partition Resizer Server is such a partition tool, which enables you extend partition, shrink partition and move partition without touching any information on your computer. This partition software works as magic on all Windows Server operating system. You need to move the unallocated space close to the C drive. Then, right click C drive and choose "Resize/Move" option. "I bought a 160GB SATA hard disk last year and installed it on my Windows Server 2008 computer. When installing the hard disk, I divided it into three partitions, namely C drive, D drive and E drive. Recently, I encountered a problem on the C drive, because I frequently receive low disk space warning message on it. It asks me to delete some files to free up space, but the problem is that I cannot delete any file from this partition. 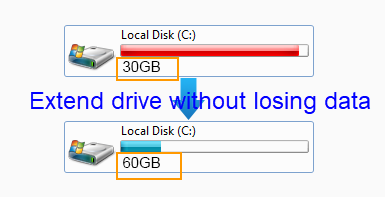 Is there any way to fix the low disk space on C drive on Windows Server 2008 apart from repartitioning hard disk?" Can I extend C drive on Windows Server 2003? How to expand C drive space on SBS 2003? How do I resize C drive system partition without reinstalling Windows Server 2008? Instead of repartitioning hard disk or moving files, IM-Magic Partition Resizer Server enables you to resize hard disk by moving free space from the partition that has lots of free space. Usually, when a partition is nearly full and has low disk space, people would like to delete some unnecessary files or move some files from the partition to another partition that has much free space. On the contrary, the professional partition software helps you move free space from the partition rather than deleting or moving any file. In such a way, you can avoid unexpected data loss in the data moving process. IM-Magic Partition Resizer Server is compatible with Windows SBS 2008 when C drive partition is running out of disk space. This partition software aims to increase the size of partition that has low disk space by moving free space from other partition on the same hard disk. This partition software works on all hard disks without repartitioning the disk. You can extend C drive whether it shows FAT32 file system or NTFS file system. You are able to increase the size of C drive without reinstalling system, so it will not have any influence on the operating system due to C drive resizing. Do you know Windows Server 2008 R2? Have you ever run into low disk space problem on Windows Server 2008 R2 C drive? 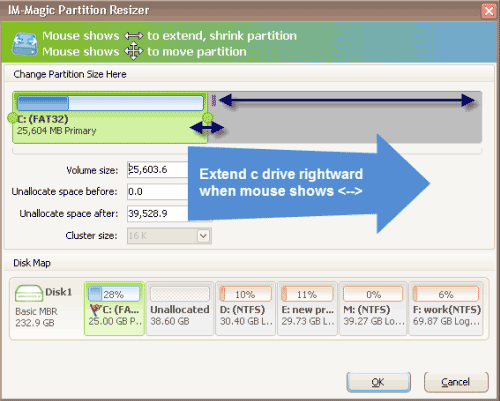 IM-Magic Partition Resizer Server can help extend C drive on Windows Server 2008 R2 as long as there is free space on other partition on the same hard disk. If you don't want to use partition software, Windows Server 2008 R2 built-in Disk Management tool also has the function of extending volume. You just need to open the Disk Management and right click C drive, and then you can see "Extend Volume" and "Shrink Volume" option. You can shrink a volume on Windows 2008 R2 to create some unallocated space, and you can extend a volume to increase the size of the partition. However, you must ensure that there is adjacent unallocated space beside the C drive before you can extend it under Disk Management.